Some people associate opera with words like stodgy, boring, old fashioned and elitist. The team at Florida Grand Opera consistently blow these ideas out of the water with their productions. For 78 years, FGO has been bringing opera to life in South Florida. 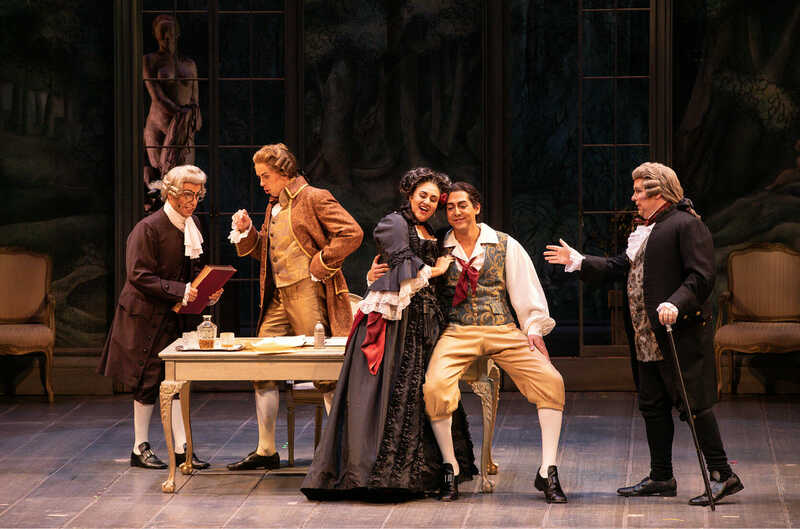 Their current production of Mozart’s Le nozze di Figaro manages to be steeped in tradition and yet modern at the same time and there are seven great reasons for you to go and see it. 7. Mozart’s work is a classic. This opera has been delighting audiences since 1786 and there is a reason for that. Plot twists galore, cunning women, lecherous men, and lots of double entendre. It is basically a soap opera that is an actual opera. Lorenzo da Ponte’s libretto is genuinely funny and director Elise Sandell makes the most of it. On top of that, the music is sparkling and gorgeous, as is typically true of Mozart. 6. Gender bending in the 18th century. The character of Cherubino is a teenage boy, but the role is always played by a woman. Mozart wrote this role for soprano Dorotea Brussani and it’s an early example of a “pants role” that was legitimately written for a woman and not a castrato. Cherubino spends most of her time on stage presenting as a boy, but due to a couple of plot twists, occasionally ends up dressing as a girl. The young man is a typical horny, love sick, teenage boy who is trying to seduce every woman he meets. Mezzo soprano Mariya Kaganskaya does a wonderful job as Cherubino with her impish smile and on stage athleticism. The return of this Russian soprano to Florida Grand Opera’s stage is almost reason alone to see this production. Ms. Petrova takes on the role of Countess Almaviva and she is a delight from the first moment she opens her mouth to the end of the opera. She was seen as Tatyana in Eugene Onegin in 2017 in Miami and has also graced the stage of the Metropolitan Opera in New York. 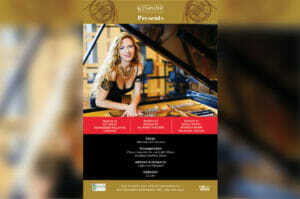 She is a world class soprano with a world class voice. Her two arias, “Porgi amor” and “Dove sono,” were both beautifully sung. Her voice is voluptuous and sensual with a clarion ring that carries to be back of the opera house and beyond. She is a true diva. 4. Susan Bernson’s gorgeous set. Originally designed for Santa Fe Opera, this set manages to perfectly evoke the ideal of peaceful country living in the 17th century. The walls for the country home are painted with verdant green woodland images. The furnishings are simple and elegant in period style. It is a perfect backdrop for this opera. Mr Bisantz is the guest conductor for this production, but he is no stranger to the Florida Grand Opera orchestra pit. This is his 8th production as a guest for FGO and this particular piece shows off his expertise in classical era music. This young soprano is taking on the role of Susanna, the intended bride for FIgaro. Ms. Galvan was formerly a member of the Florida Grand Opera Studio and is now gracing the main stage as a leading lady. Her light soprano voice is a nice contrast to the more dramatic sounds of Ms. Petrova and she fills the role of the ingenue perfectly. Her performance is solid from beginning to end and her rendition of the aria “Deh vieni non tardar” is lovely. Susanna is a difficult role for sopranos to sing because it does not have a lot of flash and thunder, but rather requires a skill for delicacy and perfection. Ms. Galvan meets the challenges of the role easily and gives a superb performance. As a whole this cast is well rounded and they are all fine singers. Baritones Jonathan Michie, Calvin Griffin, and Rafael Porto fill out the roles of Count Almaviva, Figaro, and Doctor Bartolo respectfully. Sopranos Zaray Rodriguez and Evan Kardon take on the secondary women’s roles of Marcellina and Barbarina. All of these singers, along with the comprimario singers and chorus members, work together to make a strong ensemble that helps to bring this charming comedy to life. 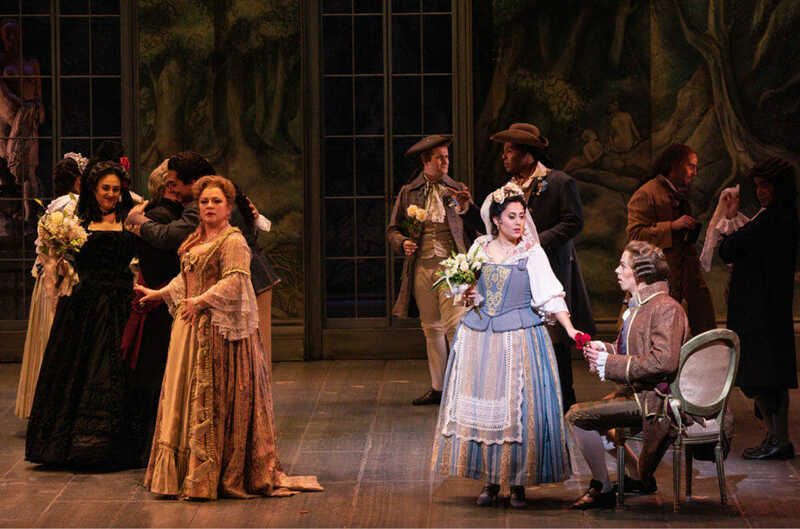 If you have never been to an opera, The Marriage of FIgaro is a great place to start. Mozart will be musically familiar to you and the plot of this opera, while convoluted, is easy to follow and very funny. The supertitles are above the stage so a fluency in Italian is not required. The Marriage of Figaro plays on various dates through February 9th in both Miami and Fort Lauderdale. Visit www.FGO.org for tickets and more information.